Food safety and nutrition standards are significant concerns for the people of India and the world over, where malnourishment can be described in terms of lack of nutrition as well as excess consumption of unhealthy foods. In the light of this, the United Nations has included in its agenda of Sustainable Development Goals, a UN Decade of Action on Nutrition from 2016-2025. India has its own guiding and monitoring mechanisms in place to curb malpractices in food production and packaging. The Government of India passed the Food Safety and Standards Act in 2006, under which the Food Safety and Standards Authority of India was established and certification by this body became mandatory for food production agencies. Having completed ten years since the enactment of the Food Safety and Standards Act, it was decided to formulate ten initiatives called 10@10 to create a drive to alter the situation and grapple with serious nourishment related issues. 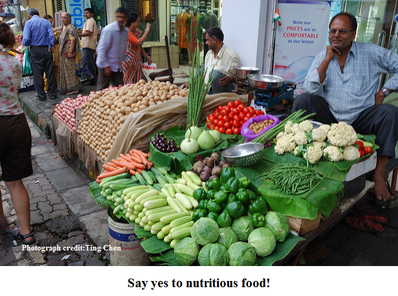 The FSSAI has two representative agencies for nutrition and food safety. One of the agencies, the Food and Nutrition Extension Unit, which is located in Porvorim, Goa, deals with nutrition. The unit is responsible for teaching women how to cook meals that are pleasing to the palate while being rich in nutrition, and about the preservation of food items, etc. However the office, which comes under the Food and Nutrition Board at the all India level, is in shambles owing to the shortage of staff. There is a need for the public to voice a demand for more staff, and better pay for them, to ensure that this necessary work is carried out to inform citizens, especially those in the lower end of the socio-economic scale. The Food and Nutrition Board has a national nutrition week that it promotes from the 1st to the 7th of September. Instead of having a centrally themed nutrition week, it seems viable to have a nutrition week in Goa that concentrates on Goan cuisine. The Government of Goa has the Directorate of Food and Drugs Administration (DFDA) which comes under the Food and Drugs Administration-India. This office is located in Bambolim and is responsible for food safety while issuing licences to food manufacturing companies. Many a time it is found that the programmes conducted by these agencies are not in keeping with the needs, or the cultural and economic position of the people. Therefore the participation of the people is of paramount importance. To ensure this, a training workshop was held recently, linked to one of the initiatives of FSSAI called ‘Citizens Connect’. The workshop was held to educate people about how they can use various media (Twitter, Facebook, email, etc) to reach the DFDA and fellow consumers with complaints in the area of food production, packaging and so on. The FSSAI has joined hands with certain companies in seeing to the production of fortified food, that is, food enriched with nutrients that may not be readily available to the human body. Examples would be wheat flour fortified with vitamins, and salt with iodine to counter iodine imbalance that can lead to the formation of a goitre or enlargement of the thyroid gland. If this fortification is to be carried out, it is but natural that the public be made aware of what the process is and how it will affect them. Apart from fortification of food, there is also the bid to equip people with the knowledge of preparing safe and nutritious meals at home. One common mistake is the overcooking of food and destroying of vital nutritional components. The FSSAI plans on bringing out a green book on safe food at home and there will be a website to which people can contribute recipes as well. Safe and nutritious food in schools is another primary focus where educational institutions will be advised to eschew the sale of foods such as chips and cold drinks. Canteen managers and school teachers will receive training to provide healthy and tasty options to pupils. Working people come within the gambit of provision of safe and nutritious food by the FSSAI, encouraging companies to change their hiring policies when it comes to canteen food providers. The aim would be to select only those who are able to supply healthily cooked food, maintaining high nutritional standards. The FSSAI is looking into the upholding of food safety and nutritional values by street food vendors, restaurants, railways and places of worship. Another initiative is to collaborate with food companies in ensuring appropriate packaging of food items. This is to make sure the food is not contaminated and degraded in terms of contributing to one’s health. ‘Diet for life’ is a campaign to reach the caretakers of children with metabolic disorders and give them information regarding specific diets. This disorder specific dietary information will be available on a website with contributions from doctors and dieticians. Food safety training and certification (FoSTaC) will be available to those who want to start their own food production enterprise. They will be given knowledge as to the guidelines they need to follow in maintaining food safety standards. IFS-Quickaccess, or quick access to integrated food standards, is an initiative designed to allow people to keep up to date with new food safety and nutrition measures. This will allow feasible implementation of rules, and monitoring of culinary establishments. Finally, the tenth campaign by FSSAI will involve better food testing laboratories. An amount of Rs 500 crores has been proposed to improve them. We, as citizens, can make ample use of the opportunities offered to us to keep to food safety and nutritional standards by actively participating in these initiatives. There is the need to educate ourselves on health hazards such as the injecting of cabbage with kerosene to keep pests away and the adding of red colouring to fish gills to make the catch appear to be fresh. In Goa, there are around 25,000 food establishments that have only 12 inspectors to scrutinise them. We can overcome the shortfalls of government agencies by using the facility of citizens connect. Provision must be made to guard against false complaints against food establishments too. Parents as well as schools should educate children and teach them to look up the nutritional value of the food they want to consume and thus make them more health conscious. The PTA (Parent-Teacher Association) can have a more active role in the campaign to provide nutritious food to children because lack of nutrition is one of the reasons why many students cannot cope with education and drop out. Awareness should be created regarding false and misleading information on packages eg brown bread that is brown owing to food colouring rather than bran. There can be a campaign to bring down prices of food grade plastic so that street food vendors can afford to supply customers with the same. People in rural areas can be shown documentaries on food safety and nutrition in vernacular languages by students who are part of the NCC (National Cadet Corps) and NSS (National Social Service). The campaigns are in place and there are options available to us to safeguard our health. The onus is on us now to make the best use of the facilities open to us. *This article is based on a discussion held at the Friday Balcao in Mapusa.